English students at The Sixth Form College, Solihull enjoyed an unusual lesson last week, when they learnt some traditional Elizabethan dances. 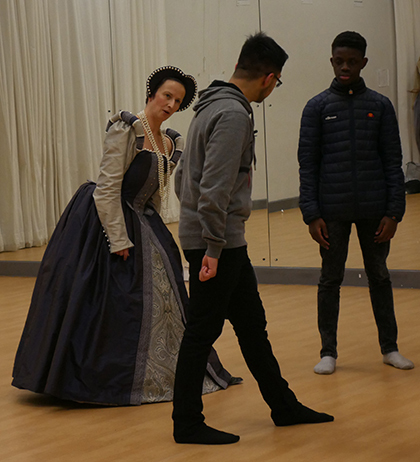 First year students on the College’s Shakespeare Academy enrichment joined Dance teacher Kathryn Waters (in Elizabethan costume) to learn the steps to some traditional court dances and some country dances. This provided a useful insight into the culture of the time and brought to life something that comes up repeatedly in Shakespeare’s plays. Also this year, Shakespeare Academy students have also visited the Swan Theatre in Stratford-upon-Avon for a production of ‘Timon of Athens’, and are returning to Stratford to see ‘As You Like It’ this month. This enrichment is offered to all English Literature or Language students who have a genuine interest in Shakespeare and his world. The Academy has also developed links in the years it has been running with several universities’ including the University of Warwick. These links with Higher Education are of great benefit to the students’ progression after they finish their A levels. Students on the Shakespeare Academy get the chance to produce an Extended Project Qualification (EPQ) as part of this enrichment. This is a private piece of research on a topic of their choice related to Shakespeare, which is graded like half an A level and get them extra UCAS points towards their university places.